1. Order by On-line Forms: When you browse the on-line catalog, an order button will appear next to each thumbnail picture of an arrangement. Clicking on the button will take you to a form that contains instructions. 3. Orders by Fax: Once you have completed the on-line order form in item number one above, print the order on your printer, or fax modem, and fax to (361) 575-2557. Please call us for all special orders and special modifications to arrangements. 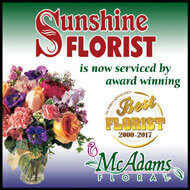 Special arrangements are not available in our on-line shopping areas. Seasonal and regional conditions affect the supply of flowers and plants. Specific varieties of colors may not always be available or meet our quality standards. Substitutions may be necessary to fulfill your floral and container requirements. All of our transactions use our secure server, which utilizes a secure socket layer, along with Netscape and Microsoft Internet Explorer encryption technology to protect your personal information. If you do not wish to transmit your credit card information over the internet, then please call or fax us. In the U.S. and Canada, same-day delivery is generally available Monday through Friday on orders received before 12:00 noon and Saturday before 10:00 a.m., both in the recipient's time zone (excluding holidays and peak floral delivery periods) and locally. All orders placed after 12:00 noon will be delivered the following day. If you have any doubt as to when you think your order will be delivered, please contact us. Delivery service is not available in most areas on Sunday or legal holidays. Items requested for these times must be delivered the day before or day after the date requested. 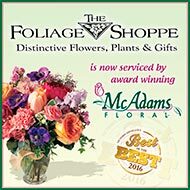 On orders received at least 24 hours in advance (excluding peak floral delivery periods) we will be happy to honor requests whenever possible for AM delivery, PM delivery or delivery by a specific afternoon time (I.E. by 3:00 p.m.) Please note however, that in some cases delivery may not be possible within the specific time constraints requested due to circumstances beyond our control. We deliver to all areas in Victoria Texas TX city limits 77901 and 77904 (77902 & 77903 are postal box only zip codes) for AM and PM deliveries. Victoria county deliveries 77905 are PM deliveries unless prior arrangements have been made. All deliveries to Mission Valley TX 77905, Raisin TX 77905, Aloe TX 77905, Guadalupe TX 77905, Nursery TX 77905, Telferner TX 77988, and Inez TX 77988 will be made in the PM.